Because surround speakers traditionally need to, well you know, surround you, the speaker bar has turned into one of our best problem solvers. These innovative new products get rid of all the messy cables and the extra speakers without ever sacrificing sound quality and the effect of surround sound. 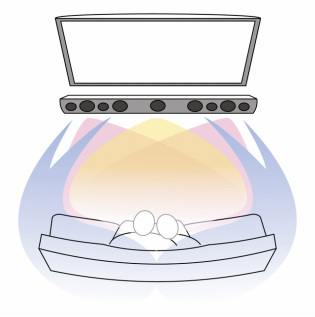 Speaker bars are mounted just below or above your flat screen TV, and correctly deliver surround sound that engulfs you in sound. Another benefit of a speaker bar is that, as shown here, they help "child proof" your investment.